I recently returned home from the United States where I was invited to address leaders attending the 27th Annual Arab-US Policymakers Conference in #Washington DC. The occasion was not only an opportunity to share my views on US global policy, talking with decision makers, as well as folks from all walks of life, was personally enlightening. The atmosphere overall was positive. I could feel a renewed buzz. I was pleasantly surprised. 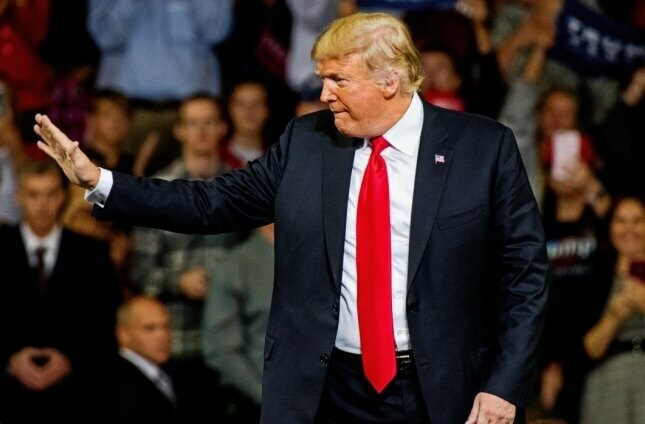 Unfortunately, the media fails to cover all the good things happening benefitting the American people preferring to expend air time and column inches critiquing US President Donald #Trump’s unorthodox solutions to problems, placing his every word under a microscope or working to dig up dirt from the past. The people I met in #Washington, #New_York and elsewhere were energized and hopeful of better things to come. That was not the case two years ago in the run up to elections when scepticism and negativity dominated discussions over Donald #Trump’s potential presidential win. Those fears were understandable. Mr #Trump was untried with no experience in public office. He promised to shake things up… and he has done just that unbound by usual conventions. When #Trump first threw his hat in the ring during 2015, I was pleased. I have long thought that America would be served by a president not cut from the usual mould of establishment Ivy League lawyers or public servants. I strongly believed that an accomplished businessman with a track record of success could do better on the economic front and hoped an economy-oriented person would not be as hasty as his predecessors to drag the planet into senseless #Middle_East wars. In August 2015, I set out my views in an op-ed titled “#Trump, a breath of fresh air among usual suspects”. Subsequent to #Trump’s victory I urged Americans not to rush to judgment in a piece headed “President-elect #Trump deserves a chance”. “America needs to do some soul-searching to discover why a rank outsider succeeded in surpassing a seasoned politician with decades of experience. The fact is that the system has let down many millions of struggling Americans who on 8 November rejected more of the same…,” I wrote. However, I did not support President #Trump blindly. I have been highly critical of some of his foreign policy decisions, in particular his controversial Muslim ban and his unilateral award of #Jerusalem to #Israel as its capital – a misguided move that has caused a deeper rift between Israelis and Arabs and one to which many American Jews are opposed. Admittedly, #Trump is not popular with many world leaders due to his open and overt ‘America First’ policies. He is an avowed patriot who believes America’s generosity has been abused and taken for granted. He is wholly transparent. He does not mince words. He was honest in his dealings with #NATO and #Europe, saying America will not continue protecting #Europe for free. There is nothing wrong in protecting tax payers’ money when many Americans still struggle to make ends meet. He has also been widely condemned for his tough stance on illegal immigration. My heart goes out to those poor, desperate families heading to America’s southern border hoping for asylum. No one would like to walk in their shoes, but no nation can permit caravans of thousands to simply walk through the gate unchecked. He is right to bar illegal immigrants while prioritizing eligible candidates who abide by the rules. Those South American countries with economic problems and plagued by gang violence should be helped to create prosperous and safe environments. His stated wish to ban children born to non-American parents on US soil from automatically being endowed with American nationality is yet another action to protect Americans. In many cases, women about to give birth travel to the US at the last minute with a view to gaining US passports for the entire family down the road. The world may not appreciate #Trump’s stances on so many issues but whatever he has done is right for America and he makes no secret of that. For sure, he has made mistakes. The imposition of trade tariffs could backfire for example. Likewise alienating some of America’s historical allies could send them closer to the arms of #Russia and #China. He is far from perfect but so far the measures he has taken are largely paying off big time. His top priorities include opening up business opportunities, creating jobs and boosting the stock market. As I write, the US economy is booming as never before. The markets have hit record highs. Consumer confidence is strong. Corporate profits are up. Unemployment is low at just 3.7 per cent. Last month alone 250,000 new jobs were created. Wage rises and tax cuts have increased disposable income. A healthy US economy benefits the world because as we witnessed during the 2008 shock, when #Washington sneezes the planet does indeed catch a cold. Today, I am once again respectfully advising Americans to rally behind their Commander in Chief. Political divisions within are manifesting in violence. The media should tone down its constant attacks that must surely distract the President from matters which count and place him on the defensive. #Congress would be wise not to engage in partisanship potentially resulting in gridlock now that Democrats dominate the House. Lawmakers whether Democratic, Republican or Independent should cooperate and negotiate comprises for the sake of the nation and its people. America will never be defeated by outside elements but if internal hatreds become uncontrolled there is a danger it could implode within. The President is not a dictator. He was chosen by the people. The US is a democracy with checks and balances in the form of #Congress and the judiciary. If the majority of voters are dissatisfied in two years’ time they can head to the ballot box. In the meantime, let him do his job in peace. Constant haranguing of the White House will deliver nothing other than an own goal. World leaders need to come to terms with this new Trumpian reality. America is no longer prepared to act as a global financial crutch. For many nations this is a wake-up call to get their own affairs in order with the goal of self-reliance and that’s a good thing. An Arab ‘#NATO’ is progressing. EU leaders are calling for a European army. Americans knew who he was before he was elected. He shoots from the hip. His decision-making is unhesitant. His handling of the North Korean nuclear crisis showed real courage as does his stand against Iranian aggression, despite objections from #Europe, #Russia, #China and the #United_Nations. He does what he believes is right for America in the face of mass protests, showing the type of courage that some of those who trod the same path did not possess. Like him or not, in my view he deserves a break. Enough sweating about the small stuff! The bottom line is that he delivers and that is what counts.